Almost forty years ago a small group of enthusiasts from the Rocky Mountain Region Porsche Club met with car nuts from Colorado Springs for a “Mini-Parade”. This was the kickoff event to help start a new region. 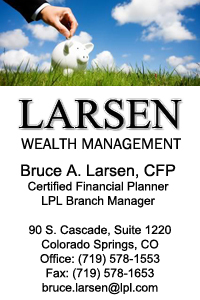 Spearheaded by Fred Veitch and Chick Misura, Alpine Mountain Region was organized and then chartered in 1975. The charter was presented by Hank Malter, treasurer of PCA, at the Zone 9 mini parade, formally starting up AMR. PCA Clubs are formed by “annexing” territory from existing clubs and meeting certain minimum membership standards and other criteria. 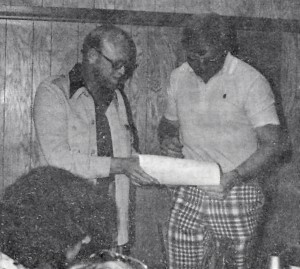 The first AMR organizational “thoughts” started in the early ‘70s. The Denver Club was very active, with lots of great events and widely distributed membership throughout the state. Travel distances were long, but most of us enthusiastically drove to Denver for meetings. Auto crossing and track events were common at Aspen, La Junta, Longmont (a go-cart track! 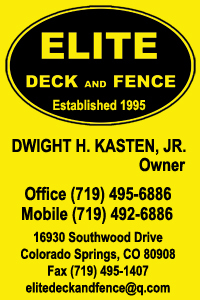 ), and Continental Divide Raceway in Castle Rock. My first Porsche, a 1969 – 912, was acquired while I was still a student at the University of Denver. Upon graduation, I married, and shortly thereafter purchased a ’72 T from Duane Mentzer, who was the owner of the newly opened Alpine Porsche-Audi here in Colorado Springs. 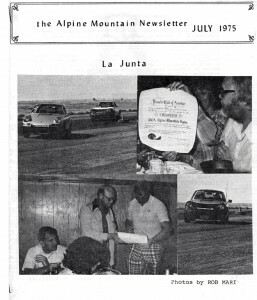 Duane was also an active participant in PCA events, and a great supporter of all things Porsche… much like we see today in Don Hicks’ Porsche of Colorado Springs. Over time, discussions began among some of us, as to whether or not a Colorado Springs chapter made sense. 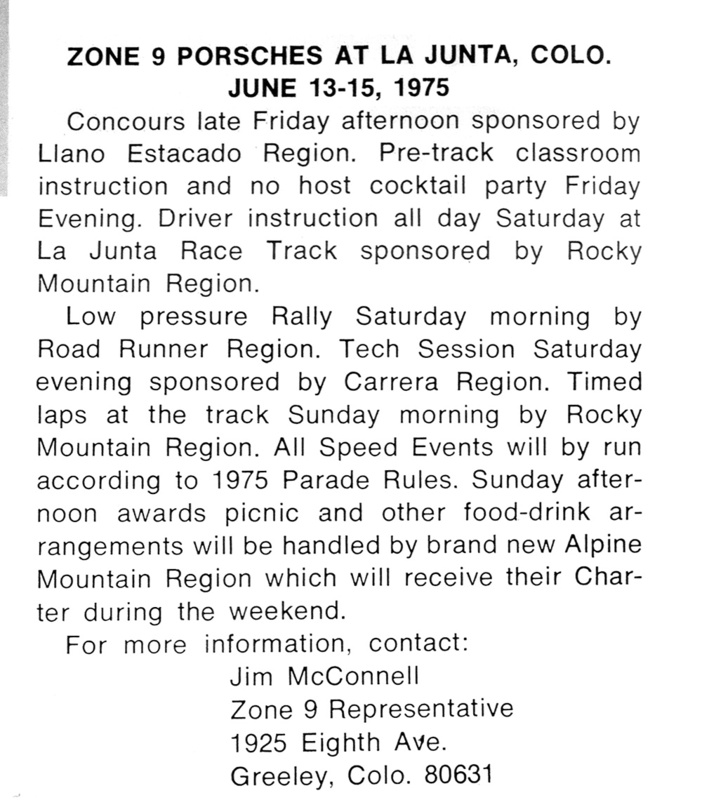 As mentioned earlier, the Colorado PCA Chapter (RMR) was an active, viable club by the early 1970’s. Members from throughout the state actively participated in events which included tours, Concours, and a tremendous number of auto-crosses and track days. It was somewhat obvious, that perhaps a second club could be formed in the southern part of the state, as it would be more geographically central to a number of the PCA members. Many of the most active members were from the southern or western part of the state, so there appeared to be a leadership group willing to start a chapter. 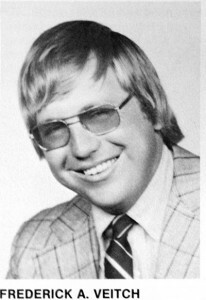 Chick Misura, whose wife Sandy subsequently became a national secretary for PCA, was president of RMR at the time our region was formed. Chick and his Board, agreed to sit down and go through the various steps necessary for us to form our own region. These included a division of counties within the state, as well as the need of our new region, to achieve its threshold requirement of 25 paying PCA members. (That seemed like a big number at the time). Several of the RMR members elected to join our new club, including; Bob Ruder from Vail and Bob Ibbotson from Denver. We also had a number of local military officers who joined, including John Boles, whose wife Judy also later became a National PCA officer. 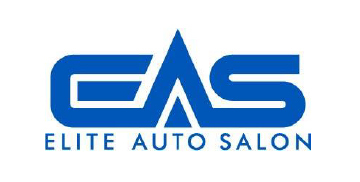 Duane Mentzer, who owned Alpine Porsche-Audi in Colorado Springs, was very supportive during our formative period. Many of our earliest meetings were at his dealership, and Duane never failed to pick up the tab or contribute door-prizes, and generally acted as a cheerleader. He was a unique individual, who is missed. It was with Duane’s permission, that the name Alpine Mountain was chosen, which paralleled Alpine Porsche-Audi; all of us recognized that a symbiotic relationship with a dealership could only benefit both sides. As a side-note to the division of the two regions (RMR-AMR): If you look at a map of Colorado, the regional line appears to go directly east-west but then it suddenly dips down below Pitkin County. This was done because RMR was adamant, that “their” Aspen track should/would remain with RMR…a small concession to get our region formed. 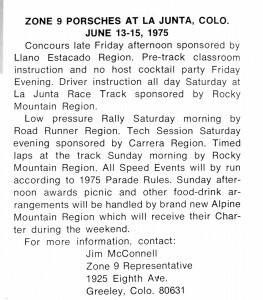 Our tracks at the time included Continental Divide Raceway in Castle Rock, which was an incredible road course, and La Junta. Pueblo had not yet been “conceived”. So we finally had our 25 dues-paying members, we settled our territorial alignment with RMR, and fulfilled all of the other requirements National had in forming a region. And so the big day arrived. We were granted our charter in late spring of 1975 in beautiful downtown La Junta. We had a regional event which included a Concours, and of course, several days of track events. The charter itself was presented by Hank Malter, who was then, the National Secretary of PCA. Hank, had become a friend of many of us in AMR and RMR regions, as he and his wife regularly came to our drivers’ schools. Hank was a member of Zone 8 and lived near San Francisco, so many of us saw him when we went to the West Coast for events at Laguna, Seca, Sonoma, etc. A good time was had by all. It’s been mentioned that the early membership of our club might best be called “a drinking club with a car problem”…and this wasn’t far from the truth. The earlier cars were much less expensive, and much more easily modified, and so they were…and the tires were getting bigger by the moment. First from 165 to 185 and then, gasp, Michelin came out with the 205, which would fit at the back of a standard 911. And then, in 1975, they came out with a turbo…and big wheels were “in”; a trend that continues today. 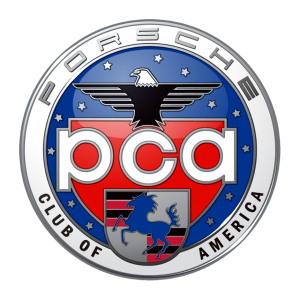 The Porsche Club of America’s history started in 1955. Their story can be found here.